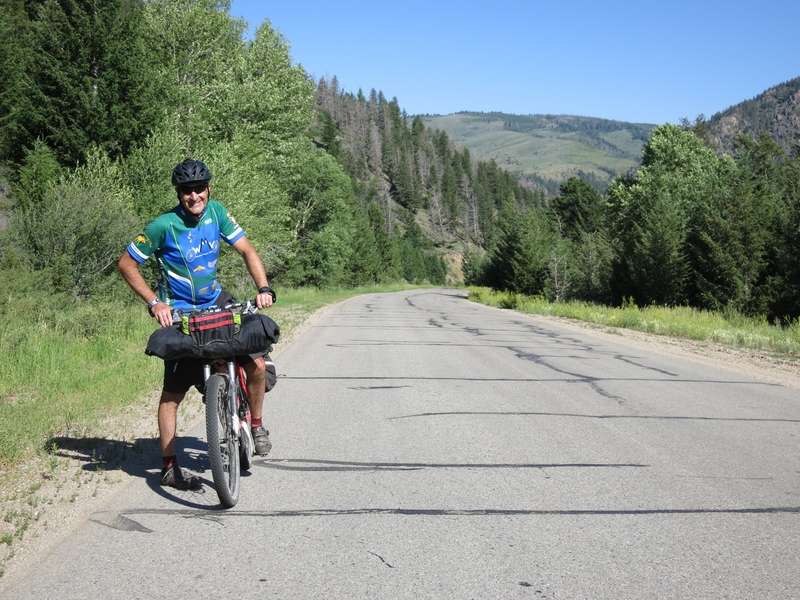 Since I started bike touring, I’ve trained myself to keep an eye open for others who might be on an adventure. Bike riders can blend into the landscape, but if you pay attention they will jump out at you. During the two weeks that Felkerino and I pedaled our bicycle around Colorado, we crossed paths with several other bike tourists. It was exciting to meet fellow travelers and learn more about their riding. We talked with people who had been on the road for months and others who, like us, had planned shorter tours. 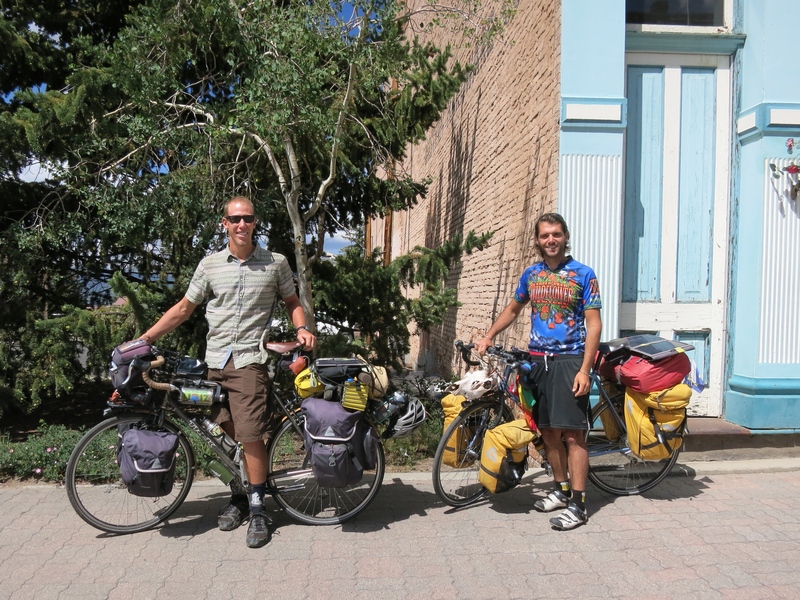 Riding the Tour Divide, father and son. 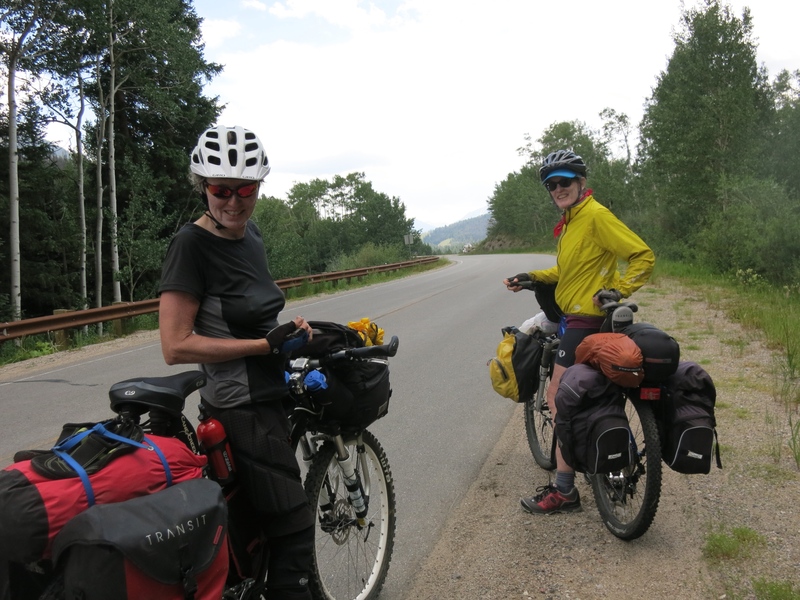 The first couple of tourists we encountered were a father and son who were riding the Tour Divide route. I think they were from Maine. They had started in Banff, Canada (in the cold and snow, we were told). We next met a group of three who lived in Colorado and were taking time out to do a shorter tour like ours. Unlike us, they were camping each day so naturally they carried more gear. 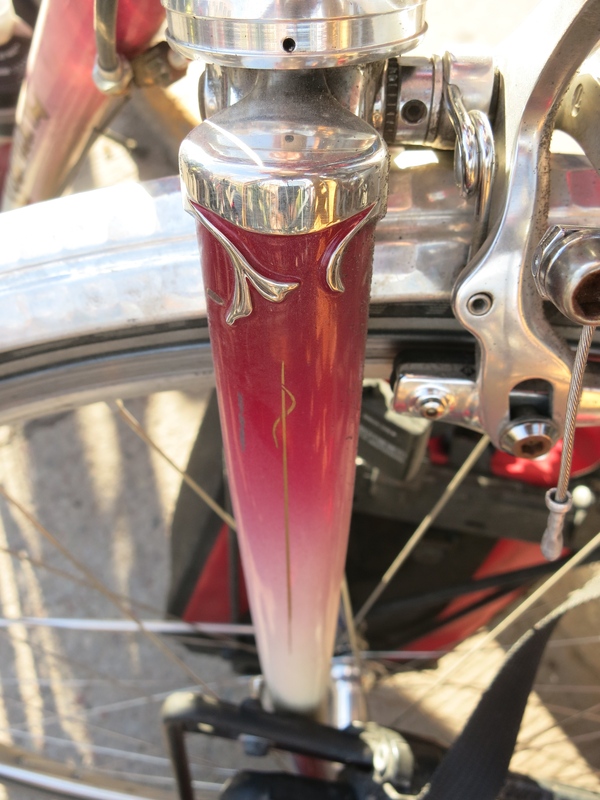 I don’t have any photos of the group, but I did take a few photos of one of the riders’ bikes. It is a Columbine custom, made in California. 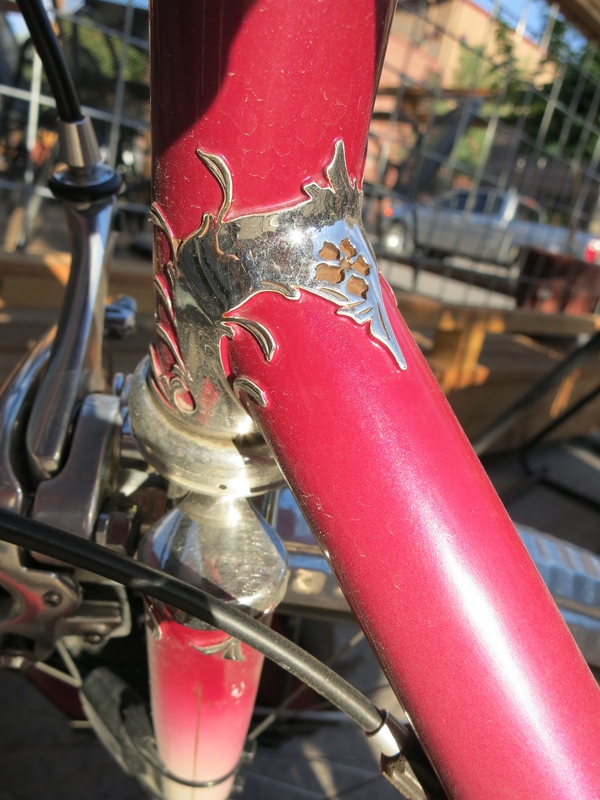 I was quite taken by the lugs as well as the overall look of this bike. 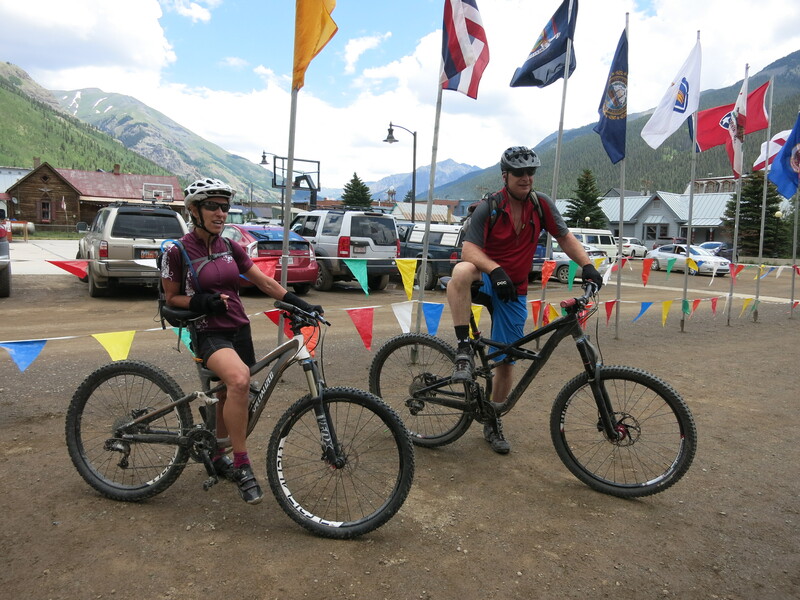 Not long after we arrived in Silverton, we met Terri and Stu, a couple from California. They were part of a group exploring the state on a multi-day guided mountain bike tour. I think they had gone over Monarch Pass, either that day or the day before. 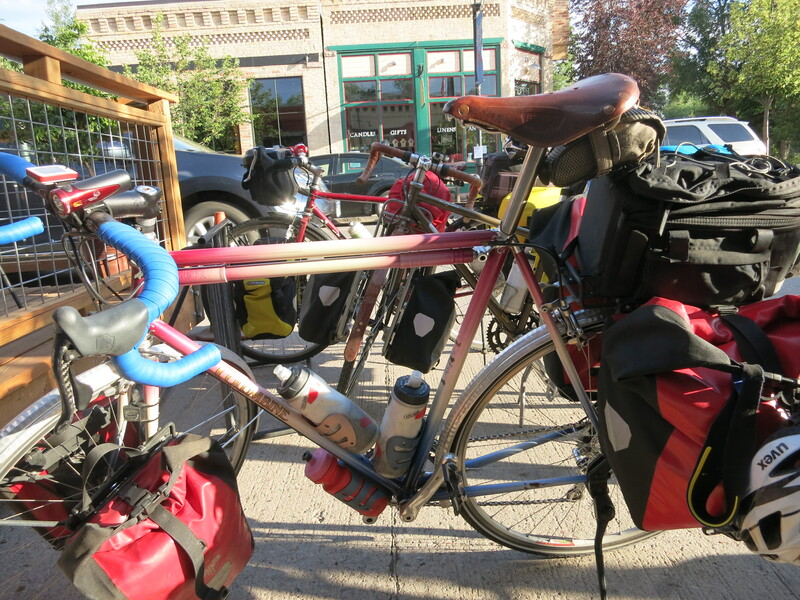 They had brought their own bikes, and their tour arranged for a van to carry their stuff from town to town. 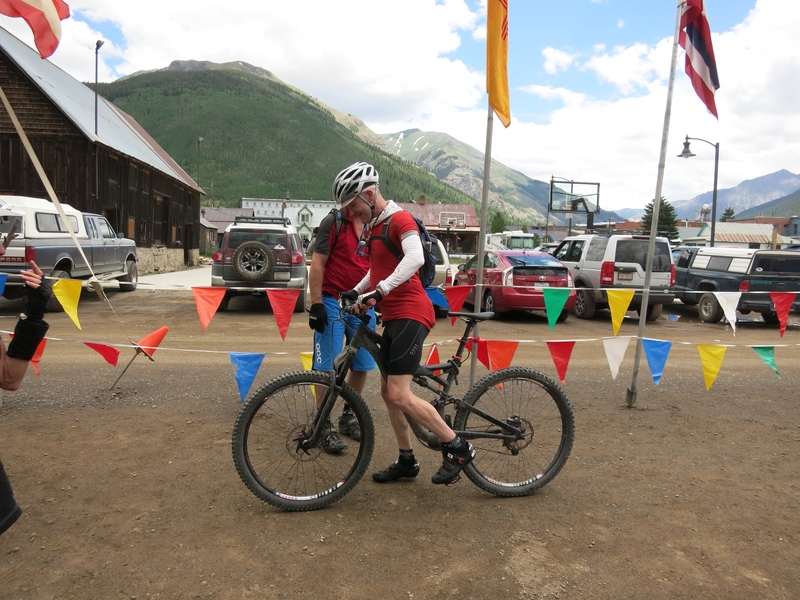 We hung out at the Hardrock 100 start together and Stu even let Felkerino check out his bike. As you know, we laid over in Leadville to rest and take care of our broken crankarm. During one of our many strolls down Main Street, we saw these two bike tourists walking with their bikes down the street. They looked to be on a big bicycling adventure and a lively chat with them confirmed our suspicions. 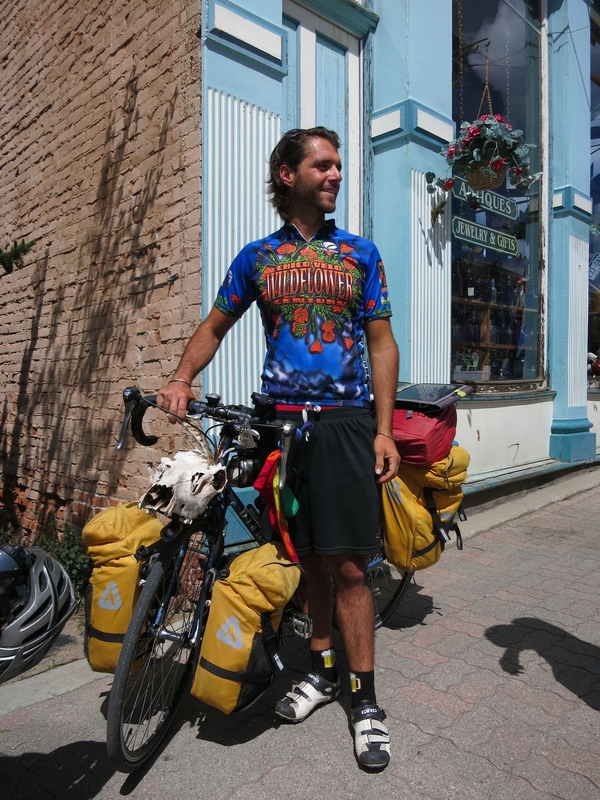 They began riding in California and were gradually working their way up to Canada. I was impressed with how much these guys carried, including the skull one of them had acquired in Arizona. One of them was on a Bianchi Volpe, and I don’t recall what the other guy was riding. 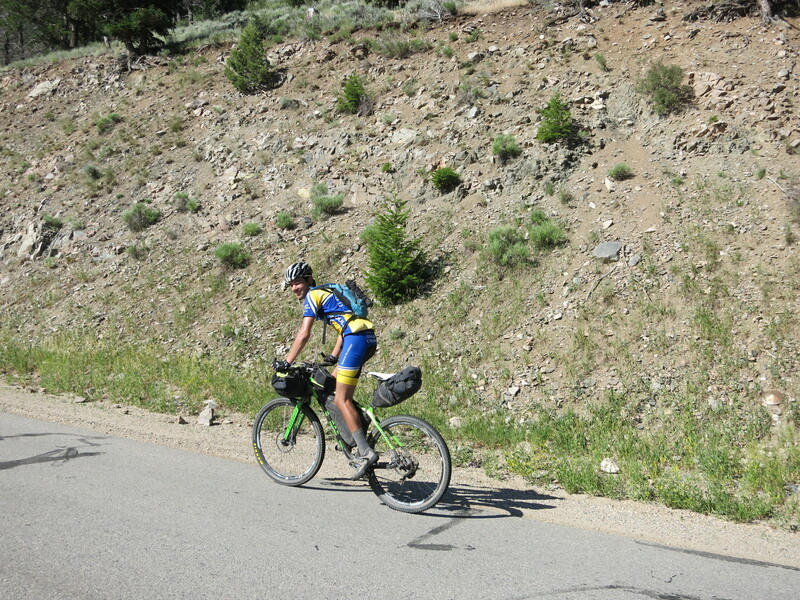 The day we traveled from Leadville to Winter Park, we saw a few touring cyclists going over Ute Pass. At the summit, we stopped to talk with a pair of cyclists and asked them if they were traveling with a group. 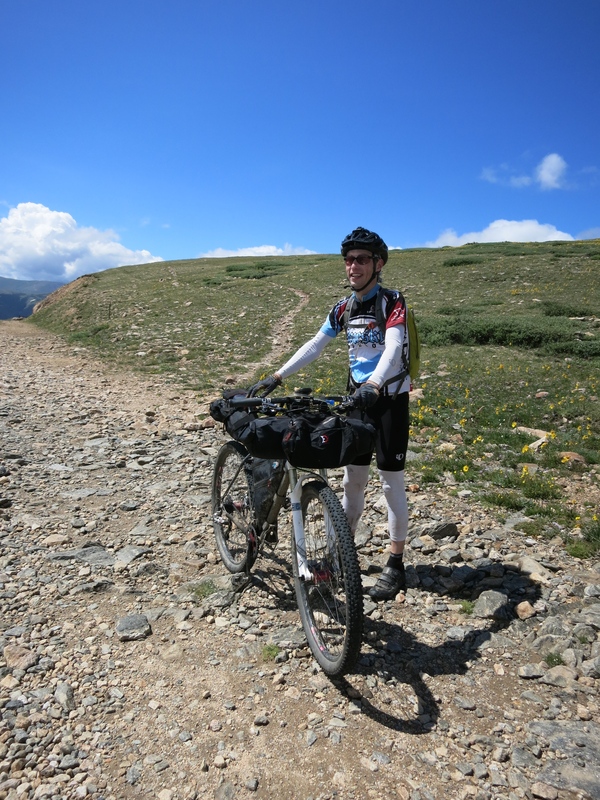 It turned out that they, along with a few of their friends who we had seen pass by earlier, were touring parts of the Divide Trail together. That was so cool. We had seen hardly any women touring cyclists, let alone a group. 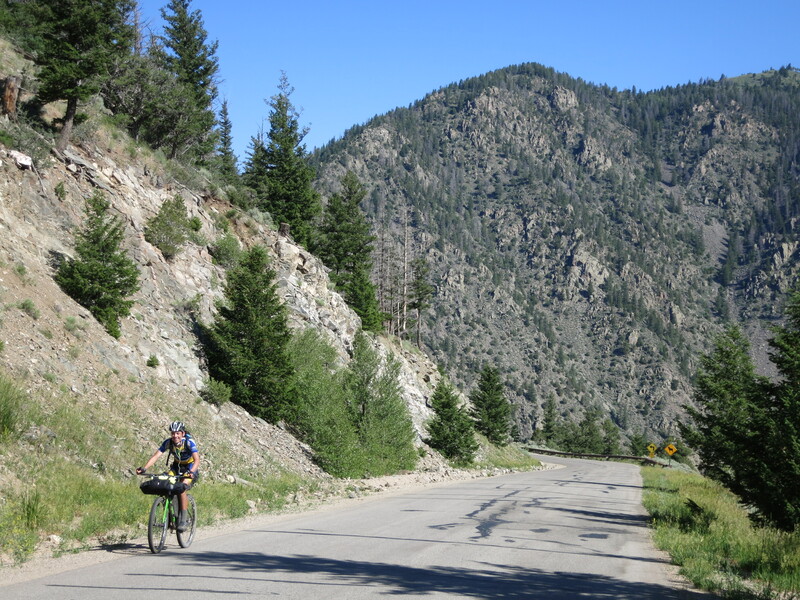 I thought we were the only people riding along Rollins Pass on our final day, but as we neared the old tunnel, we spotted a rider coming our way on a beautiful Waltworks mountain bike. His bike was loaded for a weekend of bikepacking, and he was heading to some “sweet single track” somewhere over the ridge on the Winter Park side. Unlike us, he totally looked like he knew what he was doing up there and rode along making it look easy. All the days we rode, I felt as though Felkerino and I were on a significant journey. It was vacation, but it was also a physical challenge. At the same time, there were many moments on the road where we faded into the background and became one more feature of the landscape. That’s not a bad thing at all, but it made these meetings with other bicyclists extra special. We had moments to talk with others who were riding around the state by bike and revel in each others’ adventures. Great post! One of my favorite things about commuting on the Mount Vernon Trail is the interactions I have with bicycle tourists, usually making their way up or down the east coast. They come from all over the world too. Fortunately, touring is pretty common these days. Bike overnights too. We see our share of tour groups in Vermont, especially around Lake Champlain. I love interactions with other tourists. Last year I rescued a Canadian who was walking with a wheel in his hand (I cycled home and returned to collect his girlfriend and their bikes, delivering them to the bike shop.) Another way to interact is to join Warmshowers.org, which offers a place to stay for traveling cyclists. You’ll get your fill of tour excitement! I am a post behind but thanks for sharing your lightweight packing list. I am so appreciative of those who have the courage to share their stories so the rest of us can try and shorten the learning curve!